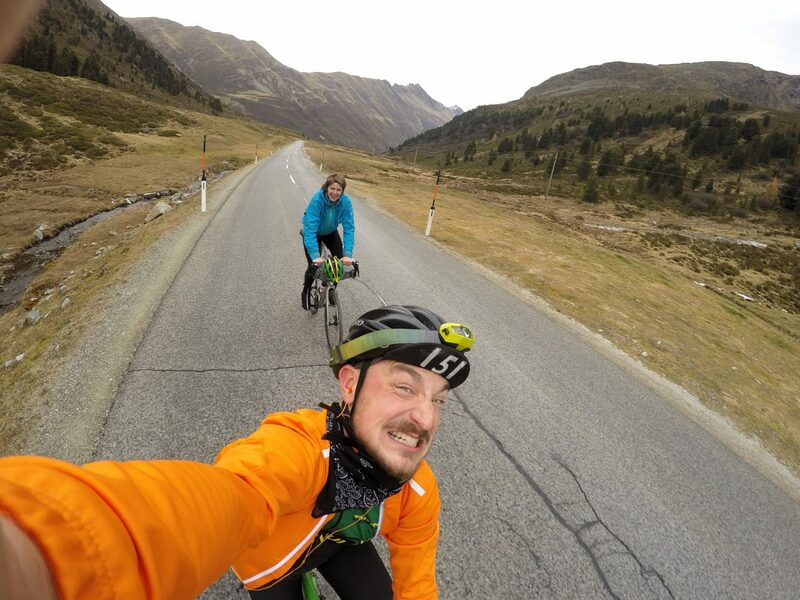 During my exchange semester in Norway I had the luck to meet Eirik, a Norwegian dude who has much more experience in cycling than I have. Together we had done a couple of long distance trips around Trondheim with lots of fun stories to tell. The last time we had cycled anything together was the Everesting Attempt, just before I started my trip home. 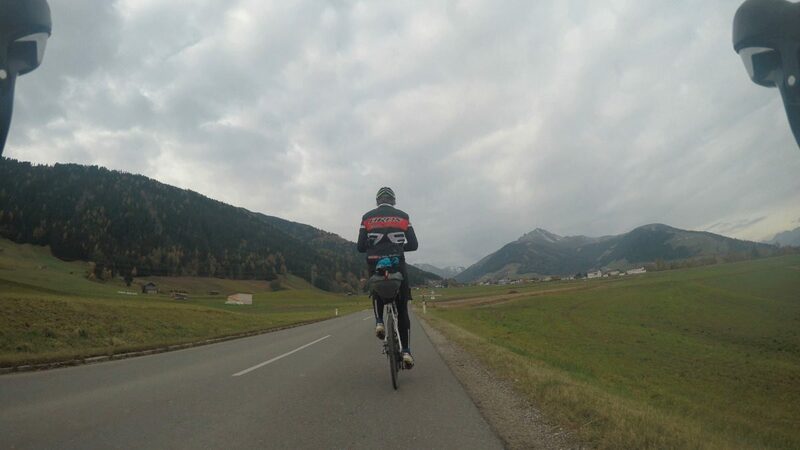 Now he is currently doing his exchange semester in Prague, which is close enough to my place that he just popped over for a weekend of climbing mountain passes in the Alps. I had intentionally planned a route of which I already knew most of the roads, since the temperatures were already dropping close to zero and I wanted to avoid any potential uncomfortable situations, especially since we were planning on sleeping in bivy bags under the stars. The single realistic spot of the whole route for sleeping outside was in the Inn valley. Since that was only 5-6 hours of riding away from our designated starting location, the train station in Schliersee, we took a train in the late afternoon to avoid arriving at the camping location too early. After an intermezzo on a bigger road with more traffic, we soon after turned onto the next toll road, which led along the Isar valley for a dozen kilometers. Usually the scenery is nice and idyllic, but since it was pitch black dark it felt like an endless tunnel of trees, with no real sense of progress. Only when we arrived in the village Wallgau and could again see lit up windows in houses did our mood rise from the lethargy, which had fallen upon us in the cold past hour. 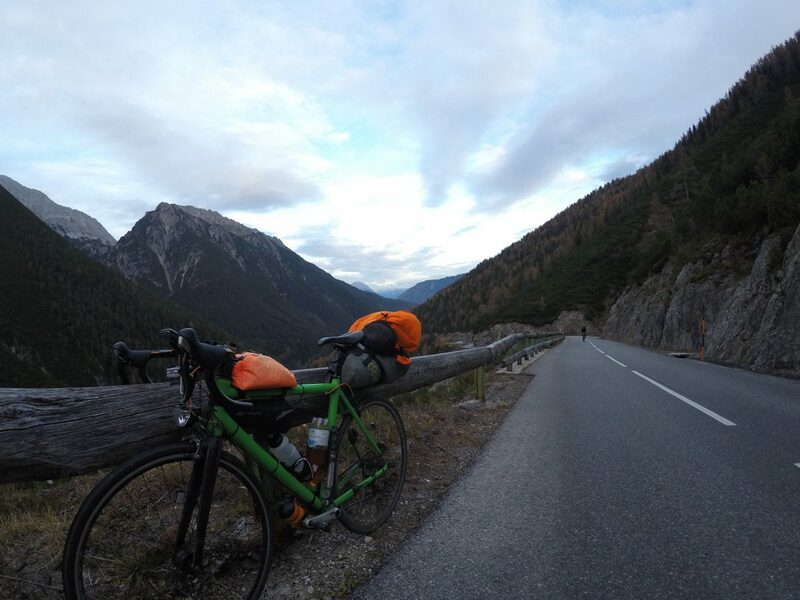 The original plan had been to ride till Mittenwald and find a Pizzeria there, but I had gotten worried that by 22:00 everything would be closed. So we stopped at the first restaurant in Wallgau and took the option to warm our bodies with lots of coffee and pizza. 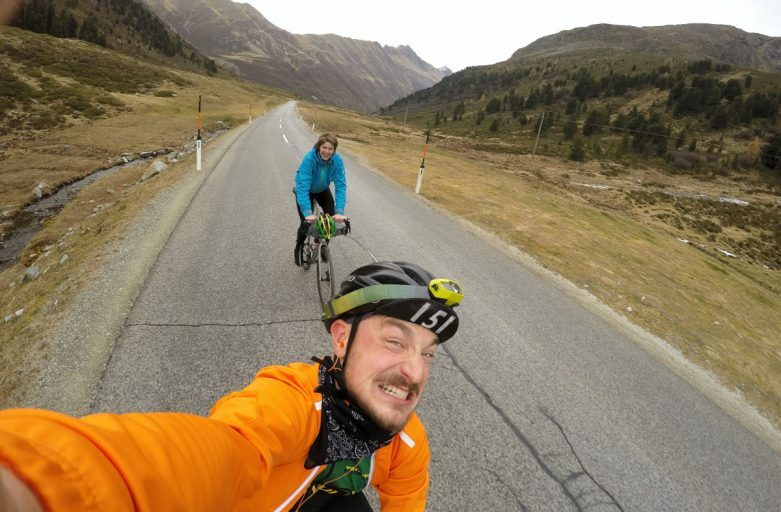 Once we had run out of excuses to stay any longer in the cozy restaurant, we headed back out into the cold and continued towards the Austrian border. Due to the darkness it was still difficult to see anything of this scenic landscape, but since I had cycled through this area already quite a few times now, I was at least able to share some “fun” memories of past odysseys (don’t drink pure apple juice just hours before a long distance trip, or you might turn it into interval training with lots of sprints to the next toilets). We gradually climbed our way up the last ramp, before we dropped down to the Inn valley. 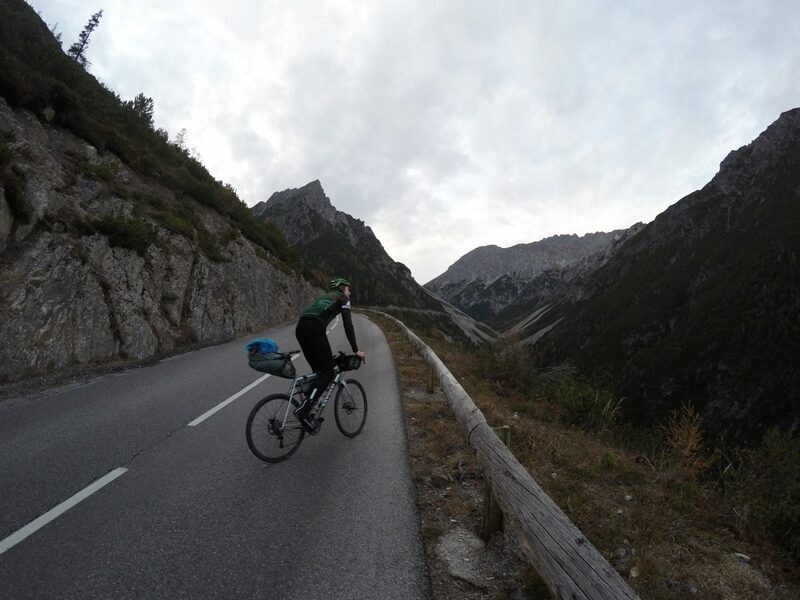 On that descent there’s one big turn in the road which reveals a magnificent view over big parts of the valley. And although I knew what was coming, it was still stunning to look down on so many illuminated houses from above. But since we were travelling at close to 60km/h, there wasn’t any time to take pictures. Once down at the river, the temperature increased significantly enough to alleviate all worries about getting too cold while sleeping. We made a little detour to switch to the other riverside, where I knew a higher chance of finding a suitable sleeping spot would exist. And sure enough, only a couple kilometers later along the bike path, we found a little trail leading into the trees along the shore, which offered enough seclusion from potential passerbys to be chosen as our camp for the night. Within minutes we had unrolled the bivy & sleeping bags and fallen asleep. The original plan had been to sleep only the minimal necessary amount of time, as to avoid freezing too much. But when the alarm rang, I still felt very cozy in my sleeping bag. One glance over to Eirik showed me that he was also still fast asleep, so I decided to snooze the alarm for over an hour until the sun had risen. But even then I had to shake him awake. Only when we left the bivy bags did we feel the cold and quickly hurried to get back on the bikes. Ahead we had 20 more kilometers along the Inn river, before we refueled at a supermarket and then took a right turn up to Kühtai, with around 1600m of climbing. Luckily the weather held, and so we could “enjoy” the at times extremely steep climb without any rain. Since the winter season hadn’t started yet, and this was the first weekend without perfect hiking weather, we had the road mostly to ourselves. Once on the top, we took a short break for snacks and to put on every layer we had, for the descent promised to be fairly cold. 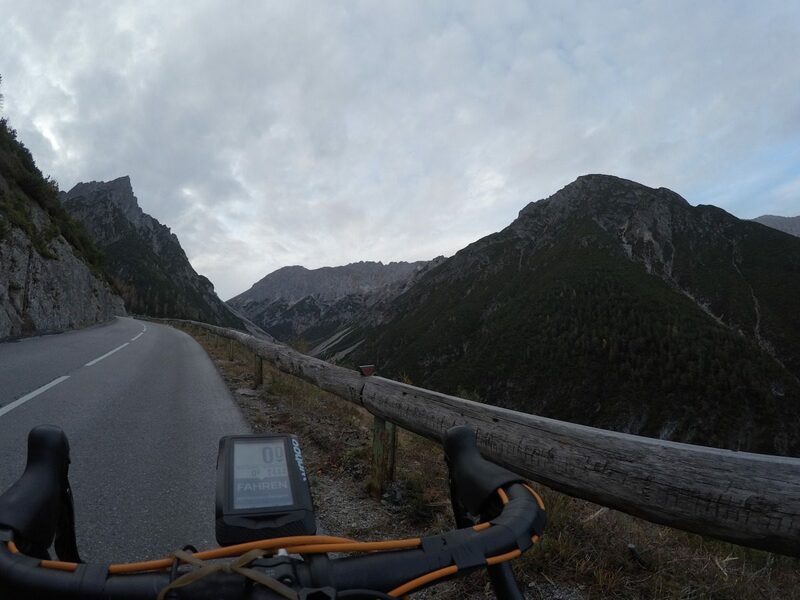 In just half an hour we dropped all the climbed altitude and found ourselves at the bottom of the Ötz valley, where we had a short discussion over whether we’d actually do the next big climb, or whether we’d take a shortcut to the train station and avoid the suffering. Luckily Eirik and me opted for the hard way, and so we hopped on a couple kilometers of highway to get to the beginning of the next climb. This is where, for the first time, I got “sprayed” by a car. I’ve had drivers yelling and honking at me, revving their engines or driving past really closely, but somehow using your windshield wiper sprayer just to annoy cyclists is just a different kind of malicious act. Especially when there’s not even a bike path next to the road, or any other kind of reason why cyclists shouldn’t be on the road. Anyways, shortly after we started climbing the next 1200 meters of elevation, a feat which would take the next 2.5 hours. The previous climb of the day was clearly noticeable in our legs, but the scenery was nice and the sunset provided a nice glow on the mountaintops. Just as we crossed the highest point the sun had set, and the darkness now provided the perfect scenario for our next episode of excitement: Early on in the descent Eiriks brakes failed, and he surprised me with a light show of sparks flying from his shoes, as he tried to come to a stop. Luckily everything worked out ok and so we recovered from the shock on the side of the road, whilst debating on what to do next, since there was literally no other way besides downhill from here. During some tinkering we discovered that the static part of his mechanical disc break wasn’t screwed close enough to the disk, preventing him from using the full breaking power. After we fixed that issue, we started descending again, albeit more hesitantly than before.